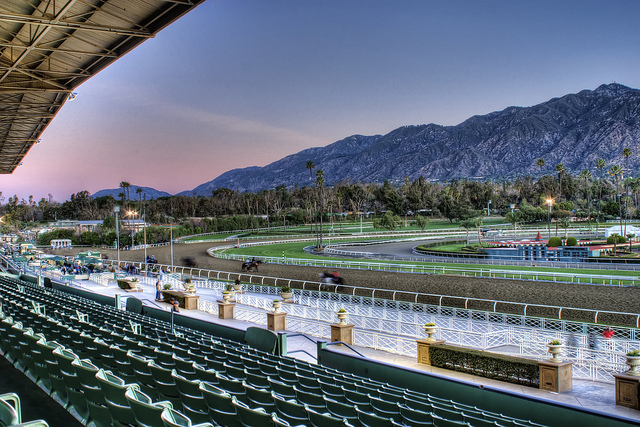 The Santa Anita Derby concludes the 3YO series in Southern California. The field begins with Dortmund, who was #1 in the latest Derby rankings. He has run the two fastest speed figures in the field, and I don’t imagine that the 9 furlongs — a 1/2 furlong longer than he’s gone before — will be a problem. Dortmund has shown a strong propensity to stay, as exhibited in his two recent races. It’s worth watching the San Felipe, his most recent race. Not only does it feature Dortmund, but also Prospect Park and Bolo, who race here today. Dortmund has already qualified for the Derby, regardless of the result here. This would be his second GI win, having captured the Los Alamitos Futurity this past December. Bolo, who was #5 in latest rankings (before the final preps began), is really exciting. He was the best 3YO turf horse in California, when Derby fever mandated a dirt try. His dirt debut was excellent. Now, he faces off again against Dortmund and Prospect Park. However, there’s reason to believe that he’ll be an even faster horse today. A horse often excels the second time they try something. An improved effort will place Bolo as a strong contender for the Kentucky Derby, and he’s my upset pick to capture his first GI today. One Lucky Dane was rushed into the Breeders’ Cup Juvenile off an impressive maiden score. I don’t mind tossing his lackluster effort that day.The connections are optimistic once again, moving One Lucky Dane from first level allowance to GI. He certainly has a chance if he improves, although his resume suggests that he dominates when he’s the best horse. He’s not the best horse in the field today, so he’ll need to show a new dimension to find enough points to get to Kentucky. I think he’s a bit overmatched here. Prospect Park has been the steadiest of improvers throughout the winter. He’s looked quite sharp in the stretch as well, particularly last time out. However, one has to wonder, if he couldn’t beat Dortmund last time out, why today? Unlike Bolo, who may improve second time out on the dirt, Prospect Park seems unlikely to continue his remarkable string of improvement. Only if Dortmund or Bolo are off their game.